The Trinity lighthouse (1838-1841) is the only lighthouse run by Trinity house outside the U.k. Its stands around 42meters of high waters and its colors the same to those of Trinity house. Its loom maybe seen as far as 27 km away. Regular maintenance are done in order to keep it running in peak condition and its looks as new. 200meters away is Nuns well opposite the entrance to the Keightley way tunnel. 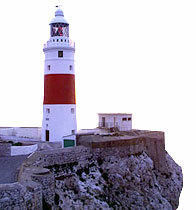 The name is said to derive from the nuns who formerly looked after the nearby Shrine of Our Lady of Europe where the Duke of Kent , Queen Victorias father, was governor of Gibraltar, he was determined to restore discipline in a lax garrison and started by closing 50 of the 90 wine houses and replacing them with his own brewery.